My kit is out of production. It has a copyright date of 1975. 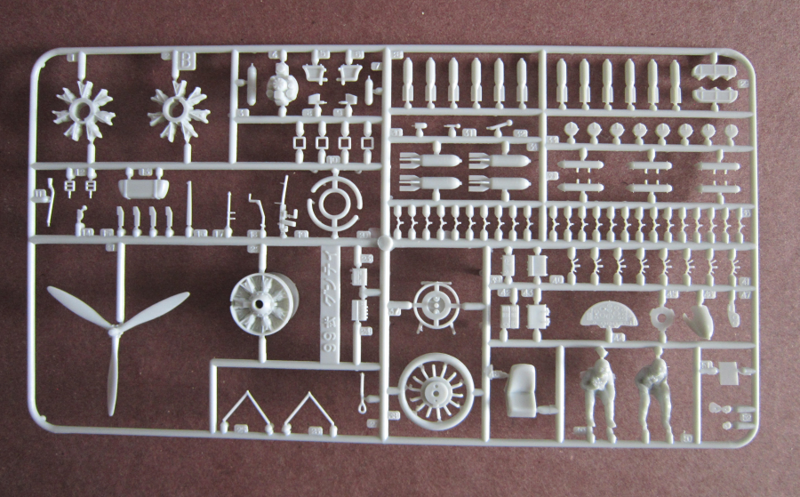 Kit is shown 3 places on e-Bay for prices $19.00 up to $35.00. 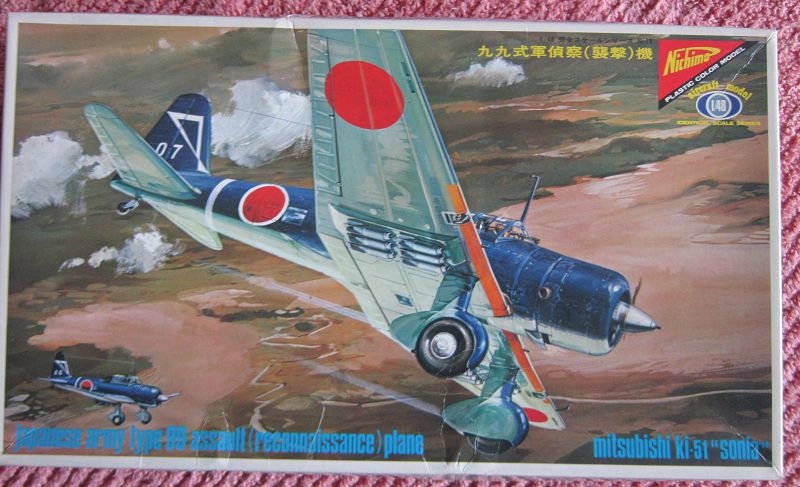 The Mitsubishi Ki-51 (Army designation "Type 99 Assault Plane". Allied nickname "Sonia") was a light bomber/dive bomber in service with the Imperial Japanese Army during World War II. It first flew in mid-1939. Initially deployed against Chinese forces, it proved to be too slow to hold up against the fighter aircraft of the other Allied powers. However, it performed a useful ground-attack role in the China-Burma-India theater, notably from airfields too rough for many other aircraft. As the war drew to a close, the Japanese began using them in kamikaze attacks. Total production was around 2,385 units. On the day Hiroshima was destroyed by an atomic bomb, two Ki-51s were responsible for the last Japanese sinking of a US warship, sinking USS Bullhead (SS-332) with all hands. Charles Lindbergh, flying a P-38 Lightning, shot down a Ki-51 after a vigorous dogfight in which the much slower Ki-51 utilized its low speed maneuverability to make a fight of it. Mansyu Ki-71: three prototypes of a tactical reconnaissance variant built by Mansyu with a retractable landing gear, did not enter production. Assault Version: Ki-51B. The assault version had armor plating protecting the pilot and oil tanks, and bomb racks to carry 441 lbs of bombs. This version could be modified in the field to carry an aerial camera. Operators: Imperial Japanese Army Air Force, Indonesian Air Force - In 1945, Indonesian People's Security Force (IPSF) (Indonesian anti-Dutch Militia) captured a small number of aircraft at numerous Japanese air bases, including Bugis Air Base in Malang (repatriated 18 September 1945). Most aircraft were destroyed in military conflicts between the Netherlands and the newly proclaimed-Republic of Indonesia during the Indonesian National Revolution of 1945-1949. With 2 units of Yokosuka K5Y "Cureng", one surviving Mitsubishi Ki-51 "Guntei" also involved in bombing operation against Dutch in July 29, 1947. Communist Chinese (captured): The last 4 Ki-51s retired in 1953. Republic of China Air Force - After the Japanese surrender the Nationalists captured a small number of Ki 51s which were used during the Chinese Civil War. North Korea - After their independence, obtained from the Soviet Union. Armament: 2× fixed, forward-firing 7.7 mm (.303 in) Type 89 machine guns (replaced with 2× 12.7 mm (.5 in) Ho-103 machine guns in later models), 1× 7.7 mm (.303 in) Te-4 Machine gun rearward-firing machine gun. Bombs: 200 kg (441 lb) bombs (normal operations); 250 kg (551 lb) for suicide operations. Nichimo was based in Japan. I don't think they exist anymore. The box art shows 2 Sonia's flying above the countryside. 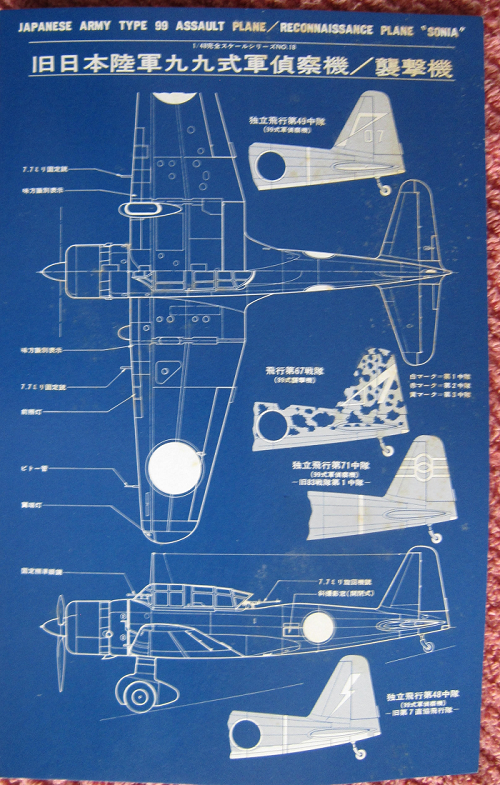 Both are illustrated with navy-blue top surfaces (this I think is wrong, because to my knowledge of Japanese aircraft it should be dark green). 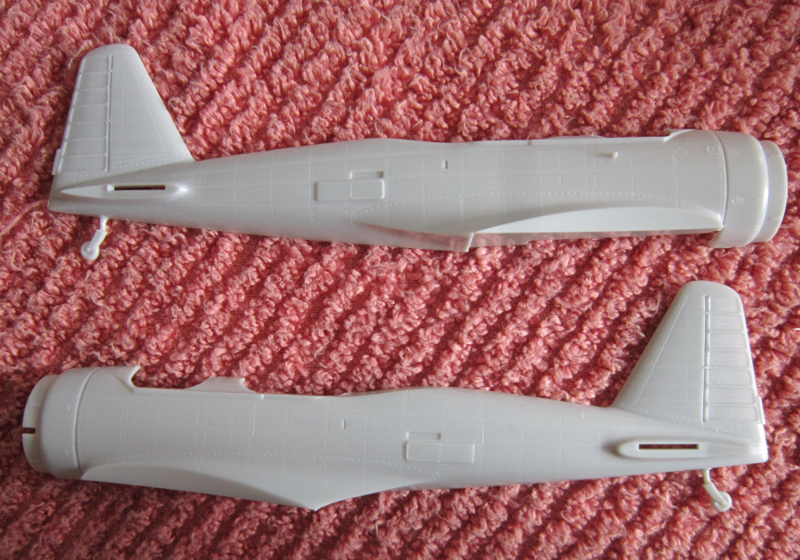 Undercarriage is light gray on both. They both have a white chevron-like insignia on the rudder. The Sonia in the foreground has a white 07 under the chevron and the Sonia behind it has a white 06 on it. They both have narrow white fuselage bands and Japanese red circle insignia that are outlined in white, bare metal spinners. One side panel has a small color profile that is a cut-away illustration of the box art scheme, followed by the history of the Sonia in English. ​Other side panel repeats the color cut-away illustration with all the the parts numbered and named in Japanese. 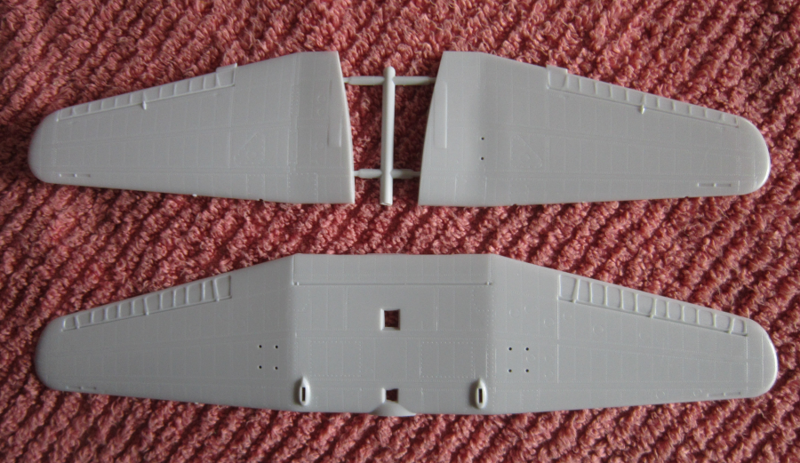 The kit contains 3 light-gray trees, 1 light-gray wing half in 3 stapled-shut clear cello bags, loose light-gray fuselage halves, clear tree, painting and marking and assembly instruction sheets and the decal sheet. ​Next are the loose light-gray fuselage halves and 3 wing halves. ​Letter C is the clear parts. 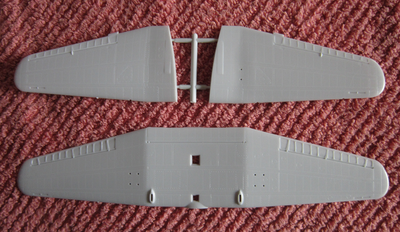 There are 4 canopy parts. ​A stiff cardboard sheet in 7 1/2" x !!" format, printed on one side is the painting and marking instructions. Markings are printed in white on an all navy-blue background and it is all in Japanese. 2. A Sonia in overall light-gray with dark-green mottle and a white chevron-looking symbol on the rudder sides that is different from the box art one. 3. A Sonia in overall light-gray with a narrow white fuselage band and 3 horizontal red stripes with 2 inter-connected red circles over the stripes. 4. A Sonia with dark-green upper surfaces over light-gray undercarriage. It has a narrow white fuselage band and a yellow lightning bolt on the rudder sides. This is all in Japanese, so I can't interpret the unit names for these 4 schemes - if they are even there. The instruction sheet is all in Japanese. It consists of a single large sheet that is 17" x 10 1/2" in size and folded 4 times along the 17" to fit the box. 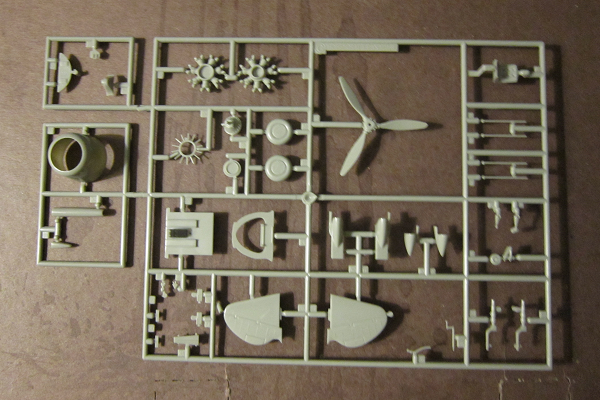 Although the assembly steps are just number 1 to 3 on it, I count about 17 assembly drawing on it, plus a black and white repeat of the box art and a listing of the names of the kit parts. Very nice detail that is lightly engraved. Detail may disappear under too heavy a coat of paint.